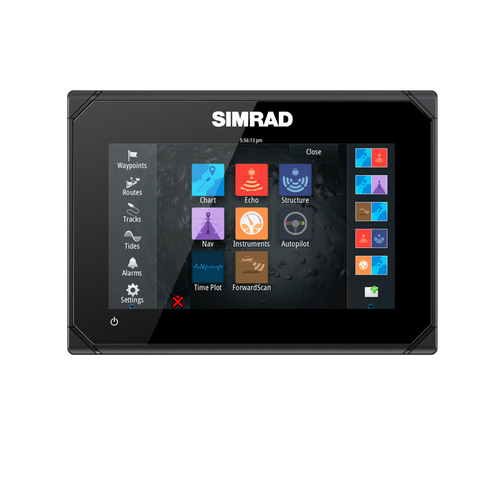 Please fill in the short form below with your question, either about the Simrad GO XSE Series, or for some technical advice. Please include details of your vessel if you feel they will help us answer your query. Get more from every day on the water with the Simrad GO XSE, a perfect fit for compact sportboats and dayboats. 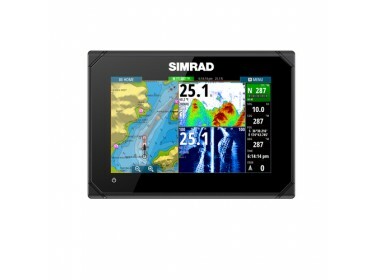 Behind its super-bright touchscreen lies a chartplotter with built-in GPS receiver, and Wi-Fi access to the latest charts and updates. Choose from an array of built-in sonar technologies. You can cruise with confidence using ForwardScan™ forward-looking sonar, or find fish like a pro with Broadband Sounder™ CHIRP sonar plus StructureScan® HD SideScan and DownScan Imaging™. The GO5 & GO7 XSE offers true ease of use with intuitive touchscreen controls that smartphone and tablet users will find instantly familiar. Tap to create or select waypoints, pinch to zoom, or tap and drag to pan smoothly across charts. Simple home screen and menu layouts make all functions quickly accessible, with large and clearly-captioned icons that are easy to recognise and tap. Both GO sizes provide you with a full-featured chartplotter, with support for the widest available range of cartography options including C-MAP® MAX-N, Navionics®, Insight®, Insight Genesis®, and NV Digital® Charts. Navigate confidently to destinations near and far, with the flexibility to choose charts that best fit your needs and location. Set and record those destinations easily with simple waypoint mangement: mark waypoints with a touch, and assign meaningful names that make it easy to look up your desired destination whether you’ve mapped out ten places or a thousand. You can fully customise either unit to suit your vessel and your favourite on-water activities – from power boating, to fishing, to water sports. Customise your home screen with shortcuts to the features you use most, and personalise it with your choice of wallpaper. Adjustable split-screen views and customisable panel layouts let you see everything you need on-screen at once, whatever your activity. 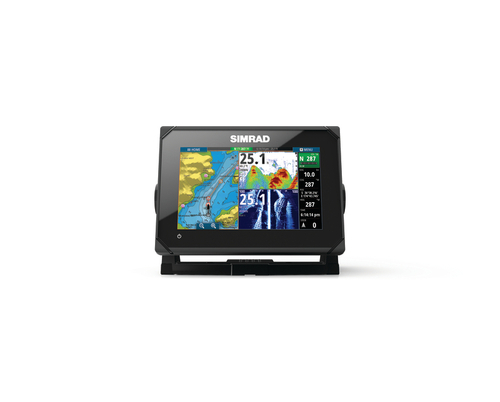 With a high-speed GPS receiver updating your position ten times every second, the Simrad GO5 & GO7 XSE is ideal for use aboard fast-moving RIBs and powerboats. Watch your boat’s movement tracked smoothly, accurately, and in real-time, without ‘jumping’ from point to point on the display. Designed with power boating in mind, the Simrad GO5 & GO7 XSE offers a unique Cruise Charting page that brings together crucial navigation data and charts in one easily readable display. Choose the information most relevant to your cruising style and on-water activities with the ability to edit on-screen data items. 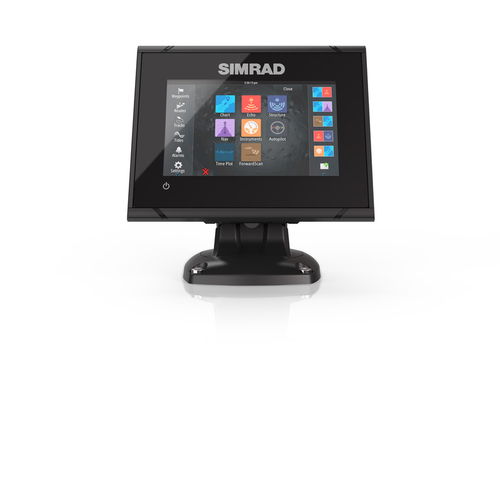 The Simrad XSE systems connects to any NMEA 2000®-capable equipment aboard your vessel including outboard and inboard engines; fuel level and flow meters; speed, heading, and water temperature sensors; and much more. Create your own custom digital instrument displays, bringing a wealth of information to even the most crowded dash while keeping a clean look with as few gauges as possible. Knowing the true depth beneath your hull can help you enjoy your time on the water with fewer worries, and makes it easier to locate suitable anchorages in unfamiliar waters. With built-in sonar, just add a suitable sonar transducer for accurate, real-time depth tracking. A scrollable depth history view lets you track back and easily set waypoints for promising anchorages, while StructureScan Imaging™ combines DownScan and SideScan sonar to offer a picture-like view of the bottom beneath your vessel. Using an optional ForwardScan transducer, this forward-looking sonar technology provides a clear two-dimensional image of the bottom in front of your vessel, allowing you to navigate shallow or poorly-charted waters with confidence. With real-time updates and a forward-looking view of up to eight times your current depth, ForwardScan lets you relax and enjoy a safer day on the water. Whether fishing is your life or just a casual hobby, any fishing trip will benefit from the extensive array of built-in sonar technology on the Simrad GO5 & GO7 XSE. Add a suitable transducer, available separately or bundled with your display, and the GO7 XSE works as a powerful fishfinder with CHIRP-enabled broadband sonar for clear detection of fish throughout the water column. With an optional HDI or TotalScan transducer, the GO5 & GO7 XSE also offers StructureScan HD sidescan imaging for a picture-like view of fish-holding structure beneath and around your boat. 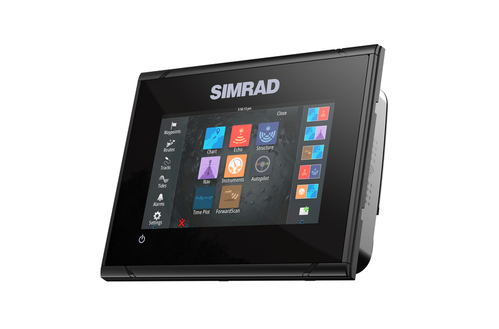 If you’re not at home on the water without a good soundtrack, the Simrad SonicHub®2 marine audio system is the perfect companion to a GO5 XSE or GO7 XSE display. Stream music from Bluetooth® connected tablets, smartphones, and other mobile devices, play MP3 files from a USB flash drive, or listen to the SonicHub 2’s built-in AM/FM radio. SonicHub 2 brings complete control of your audio entertainment to your GO XSE display, eliminating the need for a separate stereo head-unit and letting you listen to your music, your way. With Wi-Fi built in, the GO5 or GO7 XSE provides direct access to GoFree cloud services including easy wireless map downloads, software updates, and more. Whether hooked up to your home Wi-Fi with your boat trailered in the driveway, logged in to your marina’s Wi-Fi, or tethered to your smartphone out on the lake, you can access GoFree cloud services anywhere you have an internet connection. 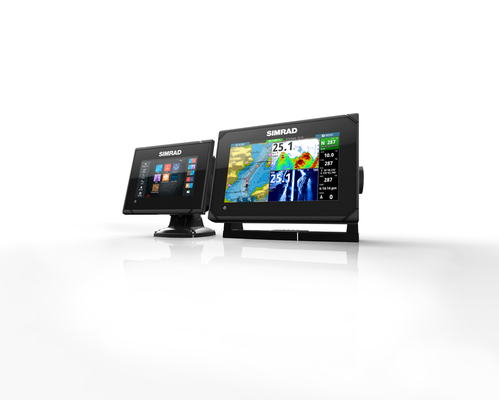 On the water, GoFree connects the Simrad GO7 XSE to your mobile devices, mirroring your display’s screen on your smartphone or giving you full remote control from your tablet with the free GoFree Controller app. 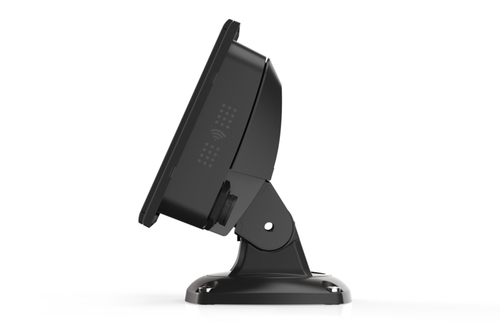 Note: Built-in GPS receiver works in any bracket-mount installation, and when flush-mounted with most fibreglass hulls. 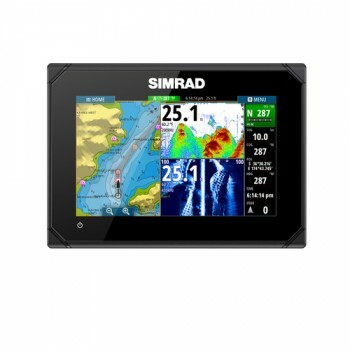 When flush-mounted in a metal hulled vessel, an external GPS receiver such as the Simrad GS25 may be required.